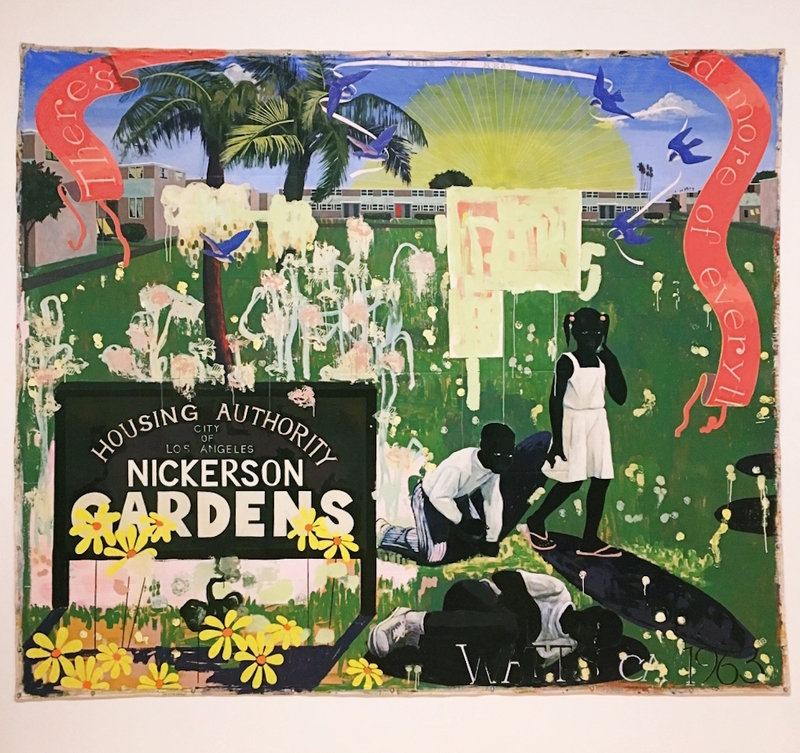 The autobiographical inspiration for Kerry James Marshall’s unapologetic paintings becomes clear once you learn that he spent his childhood living in two of the most racially charged areas in the country. In 1963, Marshall’s family moved from Birmingham, Alabama to Watts, Los Angeles. Marshall’s father had worked as a dishwasher in an Alabama VA hospital, and the family was looking for upward mobility and a fresh start in California. Ironically, dad found another dishwashing job at a VA hospital in Los Angeles. To find their footing, the family moved into an apartment in Nickerson Gardens, now one of LA’s most dangerous housing projects and the largest one on the west coast at 1,110 units. Consider for a moment that in the sixties, when Nickerson Gardens was nearly brand new, it was seen by many low-income families as a kind of idealistic and exciting place to live. It was marketed as an alternative to the slums where poor folks lived in other regions of the country. It looked modern and sleek by the standards of the day. Marshall’s family’s unit had two stories and was right next to amenities like a gym and a playing field. Residents could check out communal toys and gardening tools to use, and enjoy lots of green spaces. In theory, it was nice. In practice, life in Nickerson Gardens was tough. As Marshall and his brother got older, neighborhood violence escalated. Other kids began picking on them viciously, so the family moved to a house in South Central LA. The Watts riots happened in 1965 just after they left Nickerson Gardens, but they still lived close enough that Marshall and his brother could watch the spillover from their porch. The takeaway: LA’s housing projects introduced isolation in lieu of utopia, and became fraught spaces for black and brown people who were barred from the domestic security of the suburbs because of racism. And those somber children drowning in their own shadows that Marshall renders? They could probably see right through Nickerson Gardens’ sunny veneer to the ugly reality underneath. “Nickerson Gardens Housing Project, Los Angeles CA.” http://www.paulrwilliamsproject.org/gallery/nickerson-gardens-housing-pr... Accessed August 22, 2017.